The Meru Chakra is the most important corrective tool of Vastu and can be effectively used for correcting defects of the North (direction of health, fortune and money) and Northeast (energetically most important and most valuable area of the house). The elaborate precious metal casting (silver, antimony, copper, zinc, pewter) is covered with 24 carat gold. Precious material and the highest precision in manufacture make the original Meru chakra unequalled in its aesthetics and its energetic effect. The Meru chakra has been examined according to criteria with the aid of meridian energy measurement (with “Prognos”) in a double blind test and has been rated as “energetically very good” in total judgement. The Meru Chakra, the Sri Yantra’s three-dimensional form, is the most powerful healing tool of Vedic sacred geometry for abundance. Sri Meru Chakra is perfect for wealth on all levels – spiritual, financial, success, prosperity, career, health, fame and protection. 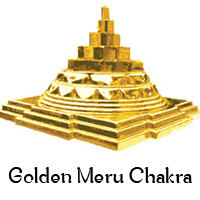 The Meru Chakra”s Structure and Benefits: Meru Chakra is a three-dimensional Sri Yantra, the embodiment of Sri Lakshmi (abundance) and Tripura Sundari (beauty). It is the yantra of Sri Vidya – sacred knowledge. It can also be seen as the unification of Masculine Divine and Feminine Divine: Shiva and Shakti, Lakshmi and Narayana, Purusha and Prakriti. When placed in the northeast, it improves the spatial energies of the whole house. Defects in the northeast and north are the most serious, so the Meru Chakra is a valuable corrective tool of Vedic yantra technology. Even if your home or office has been built according to Vastu, the Meru Chakra is a great energetic blessing that enhances the flow of vibrant energy of health and abundance. The Sri Yantra consists of triangles arranged in five levels around the center. The Meru Chakra has these same levels arranged in different heights, with the centre as the most highest level. This makes the Meru Chakra more potent than its two-dimensional form, the Sri Yantra, thus the Meru Chakra is an ideal corrective tool for disturbed spatial energies. The effectiveness of three-dimensional yantras can be optimised by correct position, but positioning is less significant than with two-dimensional yantras. Tests with skin resistance measurements have shown that the Meru Chakra harmonises all twelve meridians in the body, so it can also be useful to set up at your working place, in your office, beside the computer, or in the living room in order to harmonise these areas. If the northeast of a building has no windows or doors or is burdened with inappropriate energies such as a storage room or toilet, a Meru Chakra should be installed there. If a building has insufficient windows in the northeast or if the northeast is obstructed by tall trees or a high neighbouring house, the Meru Chakra can strengthen weakened organic aspects of life energy. The same is true for rooms, especially when people carry out healing or financial activities there. The Meru Chakra is very helpful in the north of business premises, above all in the area of the safe. When setting up the Meru Chakra, use a compass to make sure that the flat side of the central triangle is exactly aligned with the east. The Meru Chakra is made of five precious metals with either gold or silver and gold color plated. The Meru chakra has been examined with prognos, which is a meridian energy measurement by LIFETEST® criteria in a double blind test and according to the test it is “energetically very good” . It is made of five precious metals with either gold or silver and gold color plated.